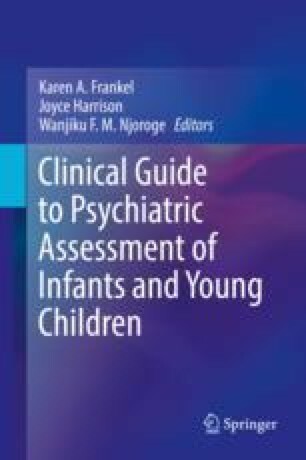 This chapter reviews the history of diagnosing mental health disorders in infancy and early childhood. The evolution of ZERO TO THREE’s Diagnostic and Classification of Mental Health and Developmental Disorders of Infancy and Early Childhood including DC:0-3, DC:0-3R, and DC:0-5™ is highlighted. These developmentally specific, relationship-based and context-driven classification systems are compared with other key nosologies such as Diagnostic and Statistical Manual of Mental Health Disorders fifth edition, DSM-5. The chapter provides an overview for the clinician of DC:0-5 approach and content as well as recommendations about how to become proficient in its use. The chapter contains a review of DC:0-5 principles and approach to diagnosis and will describe the use of the multiaxial system. Each axis is outlined so that clinicians are familiar with not only the range of possible clinical disorders described in Axis I but also how to understand relational context (Axis II), physical conditions and considerations (Axis III), psychosocial stressors (Axis IV), and developmental competence (Axis V) all within the context of cultural consideration. Information about the crosswalks with DSM-5 and ICD 10 for reimbursement of services is included.